Closed Loop Failure Analysis (CLFA) is MIL-HDBK-2155 FRACAS employed at a repair depot. It seeks to “close the loop” between the failure noted and the repair made. In its most basic form, it does this by asking the question in the top left of the graphic above. An affordable repair depot works to increase throughput while keeping costs down. Diagnosis is performed to the extent needed to ensure a repair. Large depots can contain many shops that perform their work somewhat independently of each other. A subsystem might be delivered to the depot and have a component removed and replaced and the subsystem is tested and sent out again. Meanwhile, the component may have a part removed and replaced and then the component is tested and placed on a shelf as a good spare. 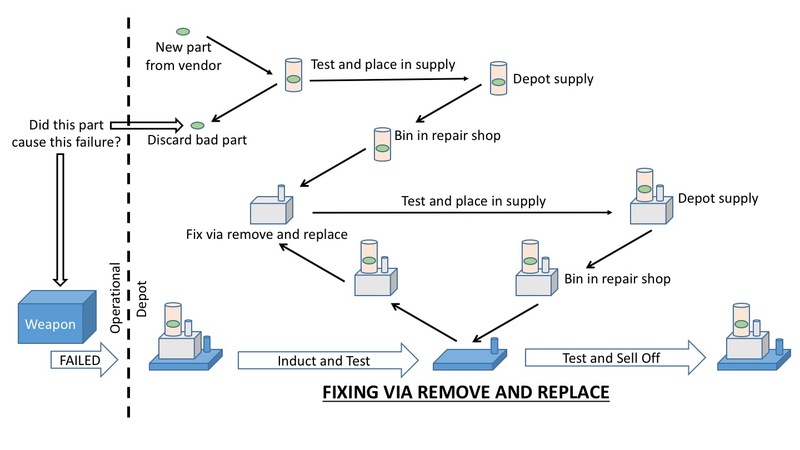 This remove and replace strategy is a good one for speed, throughput, and affordable repair. It has the potential to allow failed parts or components to remain in service and for emerging failure modes (those not thought of during design) to remain undetected. Good and great sustainment organizations will enter into agreements with their depots to ensure repairs are traced back to failures and sufficient diagnostics are performed to ensure emerging failure modes are found. Even if the program starts with 100% screening, it can quickly eliminate from scrutiny those failure modes and repairs that are well known or become well known after CLFA has functioned for a few years. A mature CLFA program will not limit its investigations to only weapon system operational failures. Subsystems and components can and do fail in the depot and elsewhere, revealing important weapon system assessment data. A mature CLFA program will also take the findings of its failure review board and use them to improve its own depot processes and equipment. CLFA demands good processes and a good information management system to handle the large amounts of data generated and analyzed.